Today marks the 90th Birthday of Bertie Bassett. Several years ago I was involved in the redesign of the global Bassett’s packaging. Things were gloomy as sales of Bassett’s Liquorice Allsorts were falling with a series of blind taste tests supermarket Allsorts were coming out on top. The senior management didn’t believe the findings so I set up a blind taste for them too, to their amazement, the results were the same. I believed Bertie Bassett was the difference. Despite being around for all the years, he had been sidelined and shown very small on the packaging – sometimes not shown at all, as Bassett’s looked for a higher end look and sweet market share. I redrew Bertie and brought him back to the front of the bag. Along with my re-drawn Bertie, three early designs can be seen here, from left to right in concept order. The last bag (on the right) was the chosen design with the Allsorts redrawn better for the final printed designs. 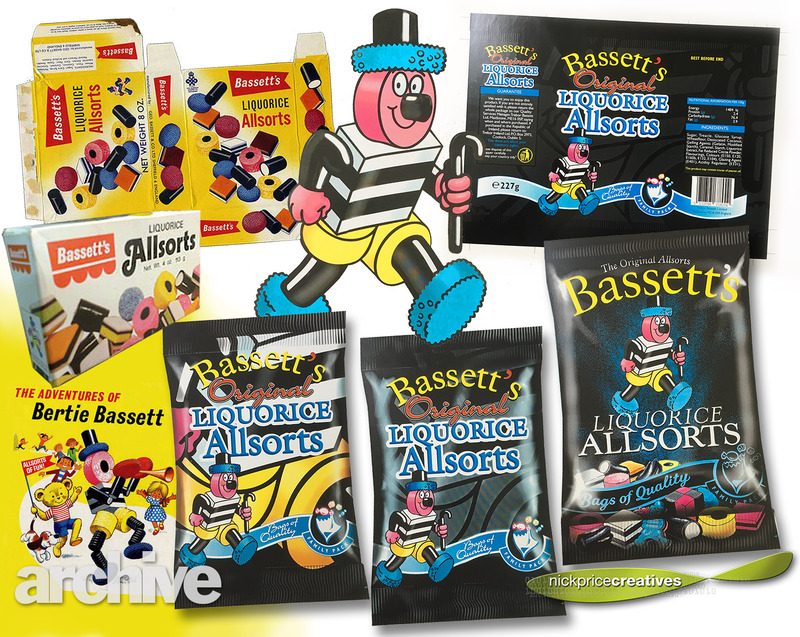 The new look was launched and Bertie re-established as the face of all Liquorice Allsorts and, as such the following year, sales rocketed.